An open bag of Popchips Nacho Cheese Tortilla Chips. After the deliciousness that was the Katy Perry kettle-corn style Popchips I sampled a couple months back, I thought I’d try another Popchips flavour. As someone who is genuinely trying to keep calories and overall food consumption in check, the allure of a healthier alternative to nacho-cheese-flavoured tortilla chips was impossible to resist. The Look: The package keeps up the Popchips brand style, with a yellow-orange-black colour theme. The chips are triangular, slightly more puffy than a typical tortilla chip, and adequately dusted with a sandy, orange-toned seasoning. They look dry and airy, more like cooked shrimp crackers than chips. The Taste: Speaking of seasoning, don’t kid yourself. 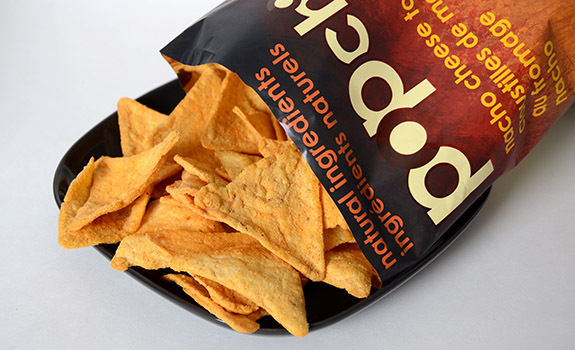 These chips are purely a delivery vessel for the nacho seasoning powder, replacing the oily, fried tortilla chips that are a gas-station staple. While I wanted these to be great, they neither satisfy on the seasoning level or on the tortilla chip level. There’s no satisfying crunch; in its place is a dry, mouth-moisture-absorbing crack, crumble and dissolve into mush. These have a completely different mouthfeel than normal tortilla chips. The seasoning has some cheesy taste and the basic tomato/garlic/onion triad, but there’s an off flavour that rankles. Cost: $2.99 for a 99 gram bag at Calgary Co-op. Availability: Limited, though not impossible to find. The stores that carry Popchips don’t all seem to carry the same flavours. They’re like Kettle-brand chips that way. Nutrition? : Per about 23 chips (40 grams): 170 calories, 6 grams of fat, 270 mg of sodium, 3 grams of fibre, 3 grams of protein. Also of note are a couple of daily value numbers: 8% for iron and 6% for calcium. The verdict: Not good enough. Snacks like this make the case for eating the real thing in tightly controlled moderation instead of indulging in these “healthier” snacks a bit more often. Too bad, as the Kettle Corn flavour was pretty great.